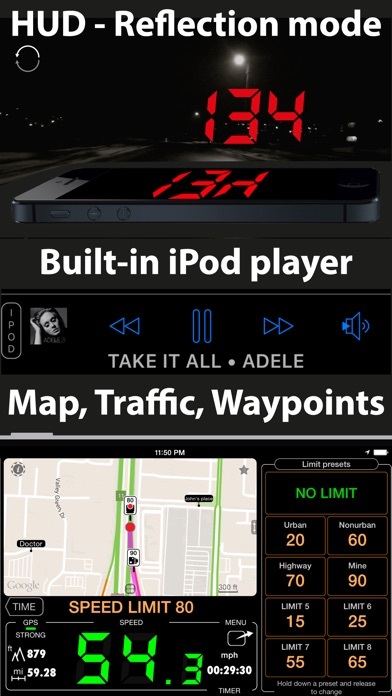 A high quality Speedometer, GPS tracker and trip cost monitor for iPhones and cellular iPads. ∙∙ When you go over a preset speed limit, the large digits change colour from green to red and the device emits a loud sound to alert you! ∙∙ The cost monitor shows you the current cost of the journey as you drive and tells you each passengers share. ∙∙ GPS tracker records your trips so they can be analyzed, viewed and shared at any moment. ‣‣ COST MONITOR. What's the cost of my driving? Based on gas price for a gallon or litre, MPG (U.S. or UK) or liters per 100 km the app will tell you what the cost is as you drive. You can add an extra cost per kilometer or mile! Useful for all cost aware drivers and for splitting the cost between passengers. ‣‣ GPS TRACKING. Where I've been? How long did it take to get from A to B? 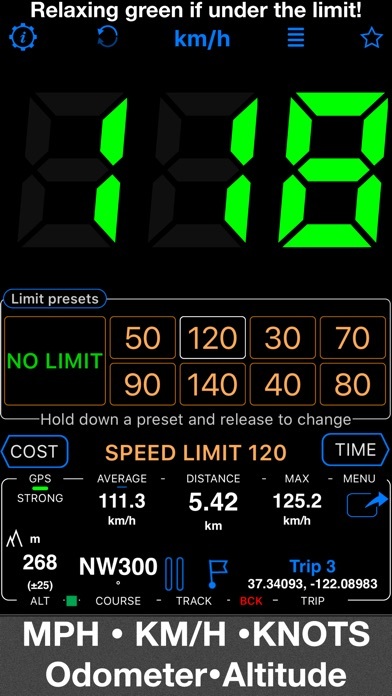 Speedometer records your trip statistics even when GPS tracker is switched off. 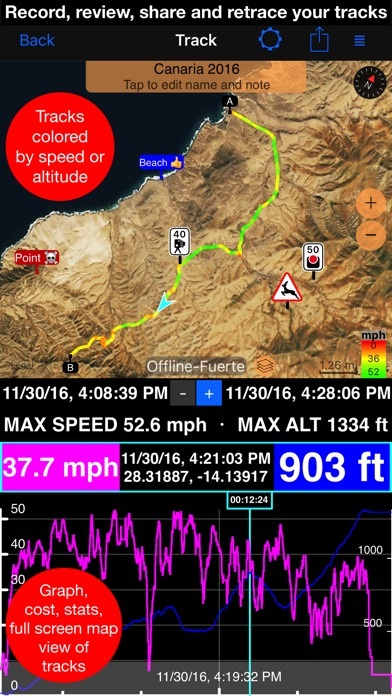 When you need point by point data to see on the map later or export (Google Earth and GPX), speedometer gives you the first class GPS tracker. ‣‣ INFOTAINMENT. When switched on, infotainment shows trip stats or weather/wind forecast when you wait. Way better than just showing you a 0 speed! 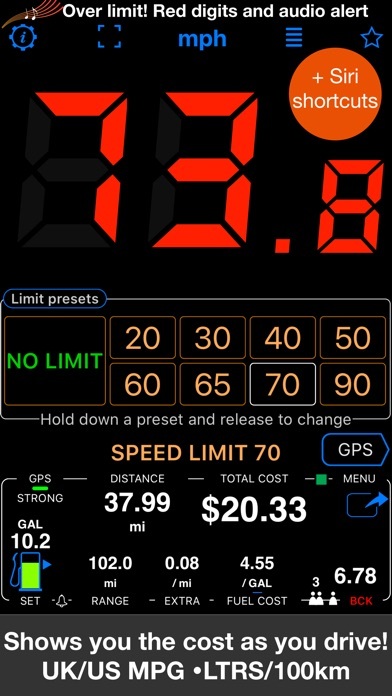 ‣‣ Easy to set speed limits and SPEED LIMIT MEMORY option Set speed limits with 4 or 8 fast and configurable presets. Presets only need a single tap and are the safest way to set the limits! With SPEED LIMIT MEMORY you just apply the speed limit once and the app applies it for you automatically the next time! 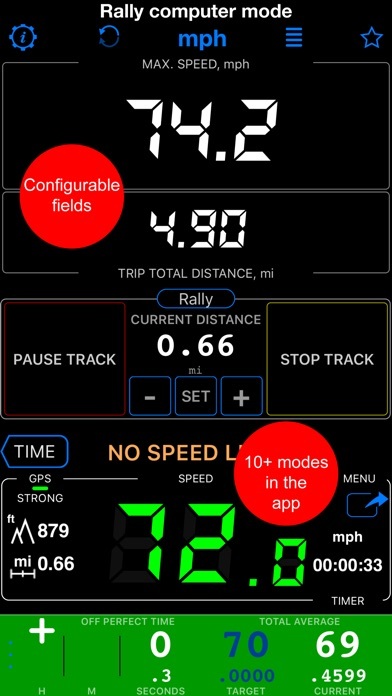 ‣‣ MODES Use MENU>MODES to turn the app into a Rally computer, G-Force monitor, Camera alerter or taximeter! Currently there are 12 modes available and we are constantly adding new ones. ‣‣ WAYPOINTS. 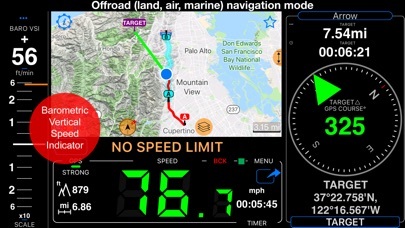 Speedometer gives you the unique way to leave a note with location and even optional photo or audio note attached! As easy as double tap on the big speed digits! You'll find more in a documentation section (star button). ‣‣ RED LIGHT & SPEED CAMERAS Import camera data into speedometer in Garmin or iGO csv formats from poi-factory.com, scdb.info or poi-plaza and let speedo alert you on a camera approach and set speed limit automatically before you pass the speed camera! ‣‣ SUNSET/SUNRISE With the sunset and sunrise information that our speedometer provides, you'll be able to avoid driving in the dusk. ‣‣ BARO VSI. Barometric Vertical Speed Indicator (VSI, IVSI) in both scale and graph forms. ‣‣ VOICE COACH. 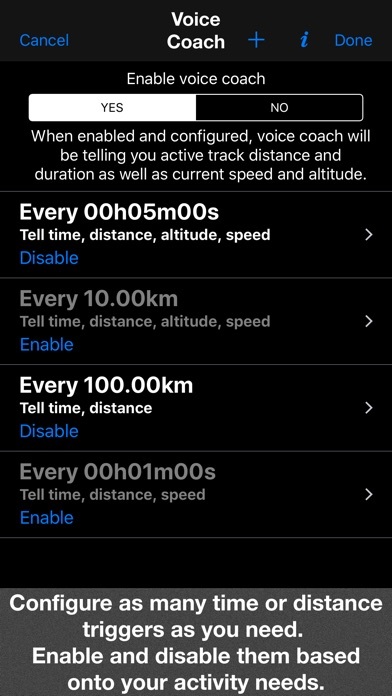 When enabled and configured, voice coach will be telling you active track distance and duration as well as current speed and altitude. 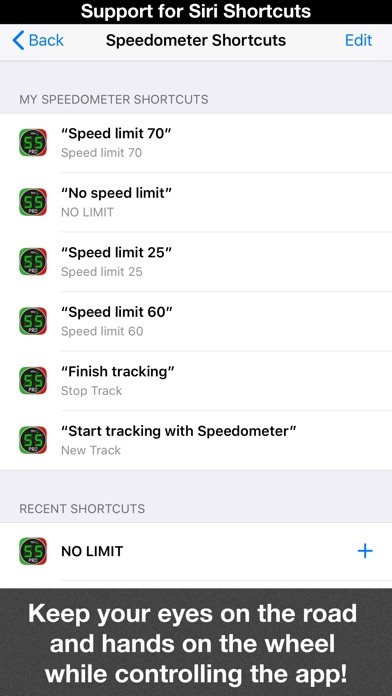 ‣‣ Siri shortcuts: New Track, Stop Track, Speed limits. + UNIVERSAL APP. 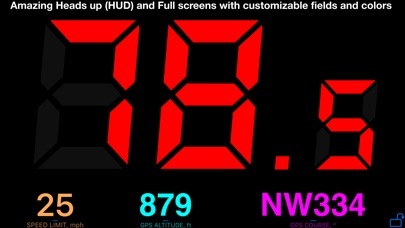 Speedometer for iPhone and cellular iPads. All in retina graphics. + 000-999 SPEED AND LIMIT RANGE. MPH, KM/H AND KNOTS. Maximum/TOP, average speed, distance traveled. + BACKGROUND MODE! Speedometer will work in background if told so and will still warn you with audio alert when exceed a preset speed limit. You can use other apps while speedometer does its job in the background! + PRIVACY. Speedometer never shares your location data with 3rd parties or ad agencies. Location data is used solely for tracking your speed and recording the GPS tracks and never leave the app unless you decide to share by means of a track export. It always let you know when background mode is on and never runs in background unless it is explicitly told to do so. ! You can use this app on your iPhone as well as on any cellular iPad. **App will not work properly on iPods and wifi only iPads as they don't have GPS (external GPS module is required). ! Please note that as with all GPS apps, continued use of GPS running in the background can dramatically decrease battery life. Drive safely, keep the log and notes and avoid paying those speeding fines! Our speedometer is the ideal companion no matter what journey you are going on! Taxican. SMS, Skype & Phone taxi booking.